Nick Derba was named the University of Maine's head baseball coach on Friday. 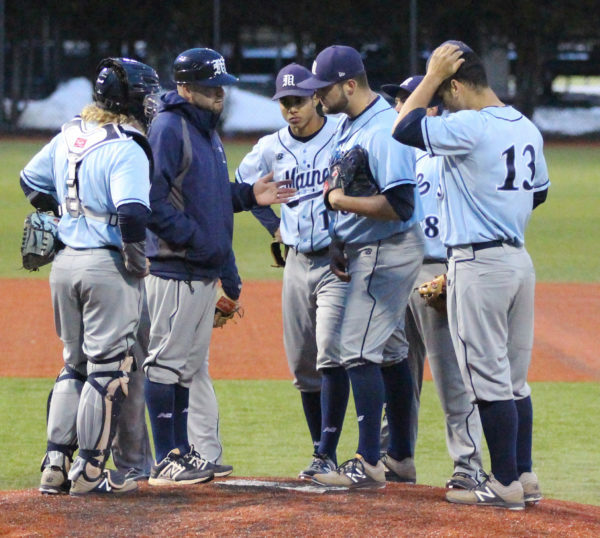 University of Maine interim head baseball coach Nick Derba (second from left) confers with his players on the mound during a game this past season. Derba was named UMaine's head baseball coach on Friday. The “interim” has been dropped from Nick Derba’s title. 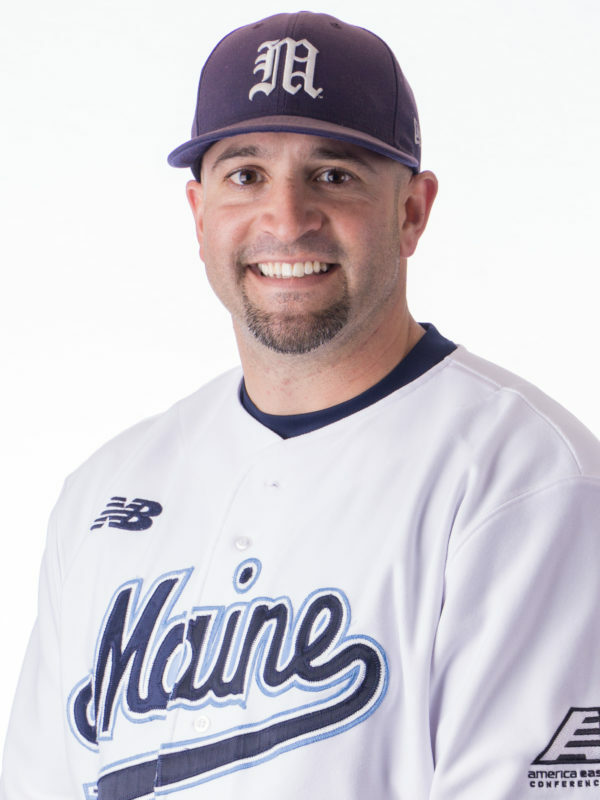 Derba, who replaced Steve Trimper after Trimper left the University of Maine’s baseball program in December, has become the institution’s 25th head coach. Trimper left to become the head coach at Stetson University in DeLand, Florida. Derba’s post will be effective July 1, University of Maine Director of Athletics Karlton Creech said in a news release Friday. Derba’s contract is for three years and will pay him $72,000 per year. Among 104 applicants, Derba was one of two finalists along with Brunswick native Gabe Ribas, who has spent the past six seasons at Santa Clara University in California, where he is the associate head coach, pitching coach and recruiting coordinator. Derba recently completed his fourth season on the UMaine coaching staff. As the interim head coach this past season, he guided UMaine to its highest win total in four years (25). The Black Bears, who finished at 25-29, reached the America East Tournament’s championship round with four consecutive victories after losing their tourney opener to Albany. UMaine lost to the University of Maryland, Baltimore County 2-1 in 10 innings in the championship round. “I’m going to keep pushing fundamentals. Mental mistakes won’t be tolerated. And we want to be the toughest team on the field,” Derba, a native of College Point, New York which is in Queens, said. He also will stress academics and community involvement, he said. He intends to target the northeast, primarily, in his recruiting travels “especially Maine guys. “I want to make sure the best players from the state are coming here. I want to give Maine guys a chance. That’s No. 1 for me,” Derba said. UMaine had eight players from the state on this year’s team and only one graduated. He added that he will continue to recruit all across the country, also. UMaine had six Floridians on the roster and all figured prominently. Derba downplayed the geographic challenges of attracting players to UMaine. He said the “program sells itself” through its tradition which included five trips to the College World Series during a six-year span between 1981-86. “If we can continue to win, that is obviously a huge selling point. And no one has facilities [in the northeast] like we have,” Derba said, referring to UMaine’s Mahaney Diamond and it’s FieldTurf surface, the Mahaney Dome indoor facility and the Mitchell Batting Pavilion. The facilities were instrumental in UMaine landing the six-team league tourney next spring for the first time in 14 years. “That will be a huge advantage for us. I’m really excited about it,” said Derba said. He thoroughly enjoys the area and lives in Bangor. “I’ve met a lot of wonderful people here. I love it here, my wife [Megan] loves it here. We truly call this place home,” he said. Derba said there will be “some changes” to his coaching staff and he intends to reduce the number of games against Division III schools, replacing them with non-conference games against Division I teams. UMaine played four in-state Division III opponents this past season. Winning the America East title and advancing to the NCAA Tournament will be the “coveted goal” every season, he said. UMaine hasn’t won the league tourney since 2011. Derba was promoted to associate head coach in 2015. He has served as the team’s recruiting and summer camp coordinator. He also was directly involved in UMaine baseball’s community outreach efforts, including fundraising for the Vs. Cancer Foundation, and team visits to Eastern Maine Medical Center, Old Town YMCA and local schools. Before joining the UMaine community, Derba was the hitting and catchers coach for the Chatham Anglers of the Cape Cod Baseball League in the summer 2013. In the 2007 Major League Draft, the St. Louis Cardinals selected Derba in the 31st round. He played six years in the Cardinal system, advancing as high as Triple A Memphis. He retired in 2012. Derba was a three-time All-MAAC first team catcher at Manhattan College. He graduated from Manhattan College in 2007, earning a bachelor’s degree in biology with a concentration in pre-med, and a double minor in psychology and chemistry. He was a three-time All-MAAC academic team selection and received the John Daly Award for community service. Derba earned an MBA at UMaine last August.